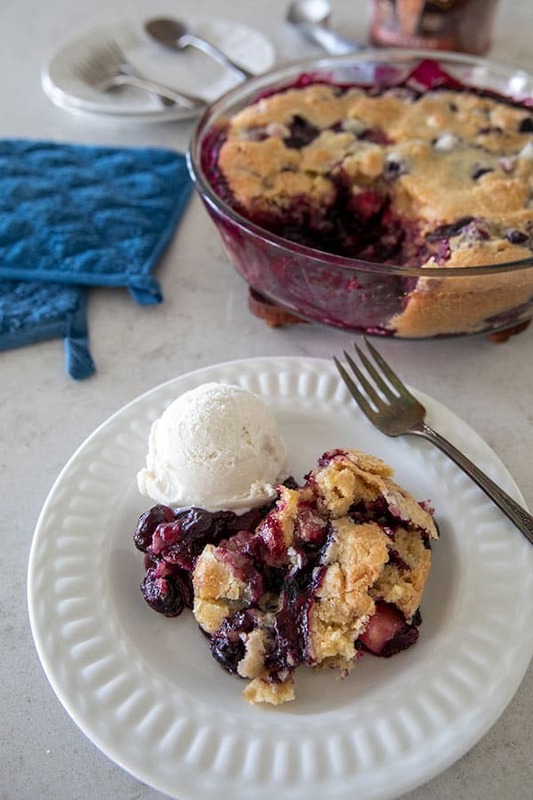 This Apple Blueberry Brown Butter Bliss is a cross between a fruit cobbler and a cake. It’s loaded with fruit on the bottom, but some of the topping seeps down between the fruit. The sugar sprinkled on top before baking gives it a nice crunch, and is the perfect addition to this old fashioned dessert. I have been making lots of things with apples lately, but one of my favorites is this Apple Blueberry Brown Butter Bliss. I received the sweetest email from a reader, Cheryl from NC. 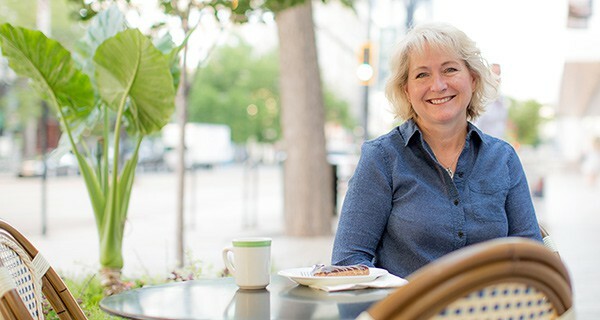 She told me how much she liked my blog and shared a few of her favorite recipes with me. One of her favorites was Browned Butter Bliss with Plums from Dinner With Julie, Sounds heavenly doesn’t it, so of course I needed to give it a try. 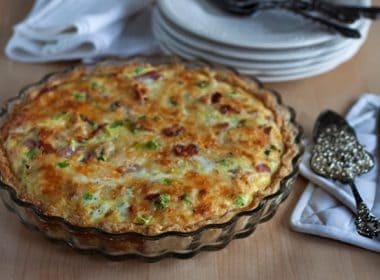 Also included in this post is a Recipe Round Up. I’ve joined a fun group of bloggers to put together a roundup of recipes on the first day of every month. This month we’re sharing Brown Butter Recipes. 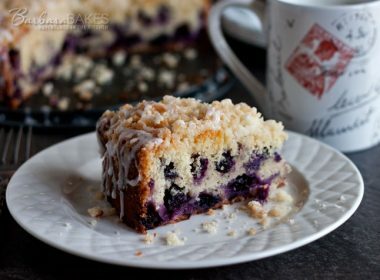 Costco had some big beautiful blueberries, so I decided to make a Blueberry Bliss instead of a plum bliss. I was afraid blueberries might be a bit too juicy for this recipe and make the top soggy, so I used the technique that Cook’s Illustrated uses in their blueberry pie recipe. 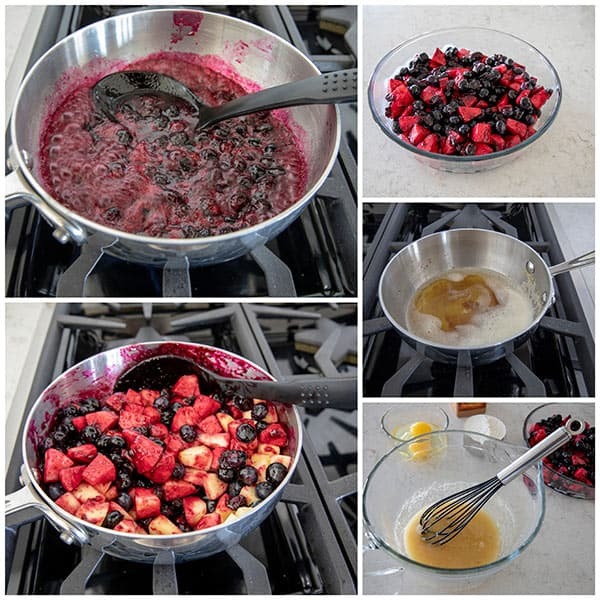 I cooked half of the blueberries to create a sauce, then added the remaining blueberries and apples. It worked perfectly. Once you have the fruit cooked, you brown the butter. Browning it gives it sort of a nutty flavor. Watch it closely so you don’t burn it. Then you combine the topping ingredients and pour them over the fruit and finish the top with a sprinkle of sugar. My family was blissfully happy with this dessert. Serve it hot with a scoop of vanilla ice are. Thanks Cheryl for recommending it. 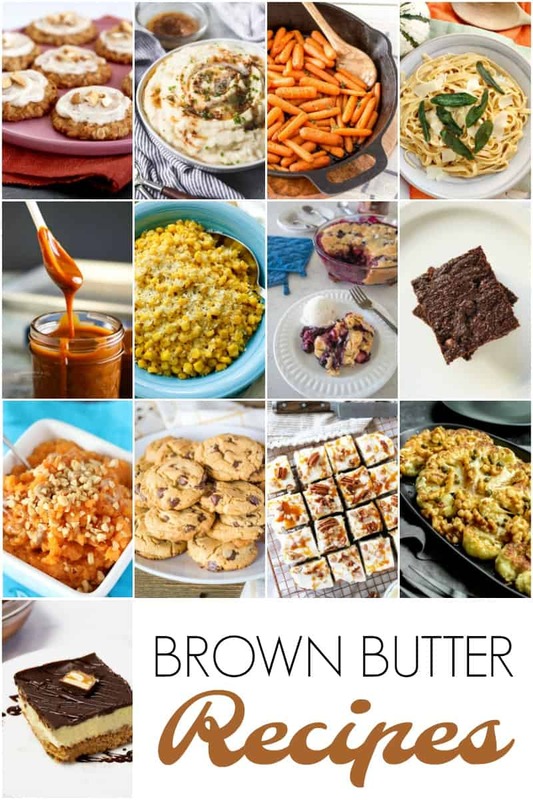 Be sure and check out all of the delicious brown butter recipes this month below. Preheat the oven to 350°F and butter a pie plate. 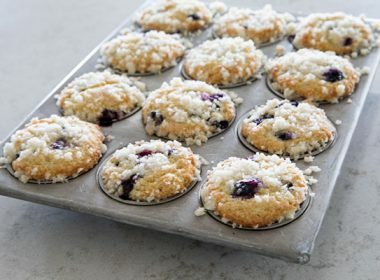 Add 1 cup of blueberries, 1/3 cup sugar, and lemon juice to a saucepan and cook over medium heat until blueberries burst and mixture is thickened. Add remaining 1 cup of blueberries, apple, lemon zest, lemon juice, and salt. Stir to combine. Spread into the pie plate. Prepare Topping: Melt the butter in a small saucepan and keep cooking it, swirling the pan occasionally, for about 5 minutes or until it turns golden. Pour into a bowl. Stir 3/4 cup of sugar into the butter, then the eggs, then the flour and cinnamon. Pour over the fruit and sprinkle with raw sugar. Bake for 40-45 minutes, until golden and crusty, and the juices ooze from around the edges. 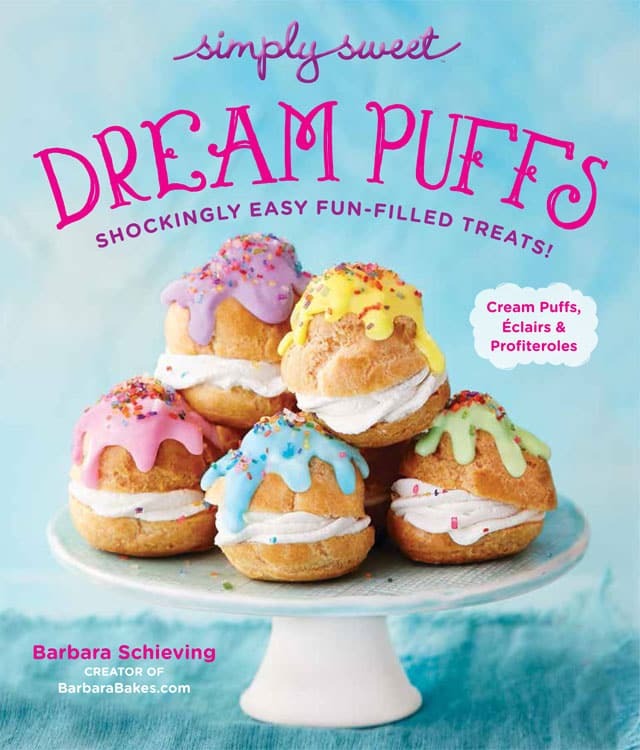 Serve warm with vanilla ice cream, whipped cream or thick vanilla yogurt. Do we add sugar twice in the filling? Also, salt is not listed. Hi Kathie – I’ve updated the recipe to clarify. Enjoy! 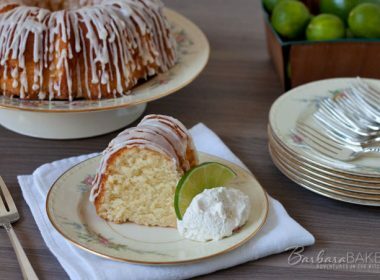 What a great year round recipe! Looks amazingly delicious, thanks for sharing. Barbra I do have a question for you. In the ingredient list for the filling there is no mention of tapioca, or salt. 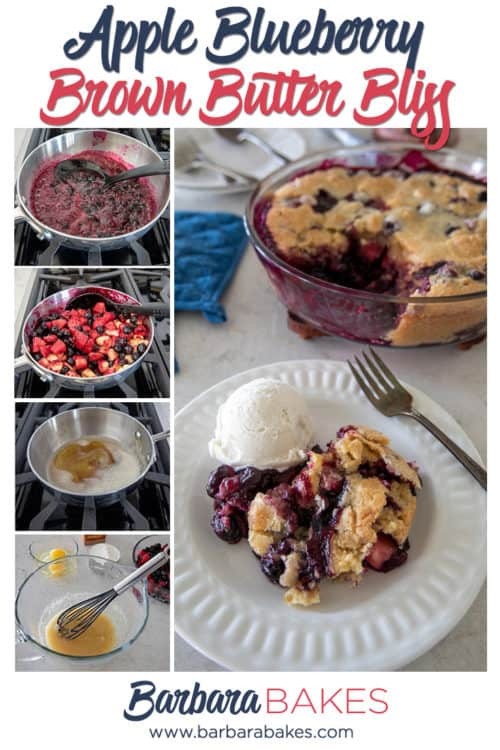 But…in the instructions (#3) it states to add the second cup of blueberries, lemon juice (which I added to the first 1 cup of blueberries), tapioca, salt and sugar is mentioned again. What did I miss? I have this dessert in the oven as I write this. 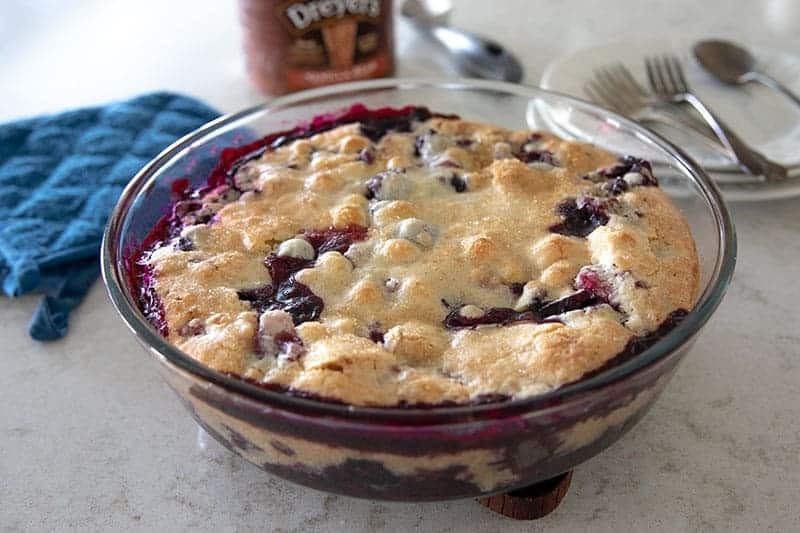 Hi Debby – sorry for the confusion, I omitted the tapioca in the recipe. I’ve updated the recipe. Enjoy!! Funny, I'm actually looking for new bedding. I want something super luxurious in purple! What a wonderful dessert, and what an intriguing kitchen tool. 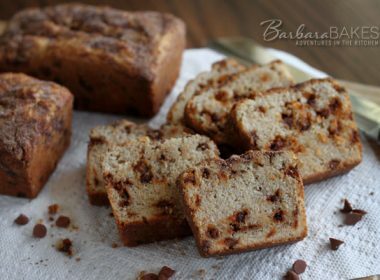 never heard of an apple peeler Barbara, and am absolutely loving the dessert you made with it! My dream bed would rock on the moon!! My dream bed would be a bed with a place cut out so I could sleep on my belly, since I am 8 months pregnant. I miss sleeping on my belly!